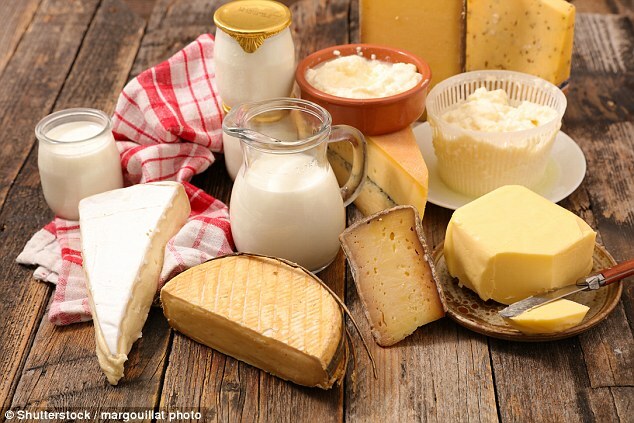 Dietary guidelines in the US and UK recommend people people opt for low or no-fat dairy, however, the researchers warn such options are often high in sugar, which can drive heart disease. Milk, yoghurt and cheese contain nutrients such as calcium, which lowers blood pressure, as well as anti-inflammatory fatty acids. DO WALNUTS PREVENT HEART DISEASE AND BOWEL CANCER? A handful of walnuts a day may prevent heart disease and bowel cancer, research suggested in May 2018. Eating just a third of a cup of walnuts for six weeks significantly reduces the production of excess bile acids, as well as lowering ‘bad’ cholesterol levels, a study found. Previous research has linked such bile acids to bowel cancer, while lower cholesterol levels are associated with a reduced risk of heart disease. Researchers believe walnuts’ high-fibre content encourages the growth of ‘good’ bacteria in the gut, which benefits people’s heart and colon health. The scientists also found that despite walnuts being relatively high in calories, with around 28 per nut, only 80 per cent of them are absorbed, with gut bacteria using up the remaining 20 per cent. Results further suggest people who eat a handful of walnuts a day produce less secondary bile acids, which are made in the bowel rather than the liver like their primary counterparts. Lead author Professor Hannah Holscher, from the University of Illinois, said: ‘Secondary bile acids have been shown to be higher in individuals with higher rates of colorectal cancer. ‘Secondary bile acids can be damaging to cells within the GI tract and microbes make those secondary bile acids. The researchers, from the University of Texas, Houston, analysed nearly 3,000 adults aged over 65 for 22 years. The participants’ plasma was assessed to determine different levels of fatty acids in 1992, and then again six and 13 years later. This comes after research released last January suggested soya ‘milk’ is the healthiest alternative to cow’s. When analysing the four most popular non-dairy alternatives, soya was found to have the greatest nutritional profile due to its high levels of anti-cancer compounds, known as isoflavones, a study found. Although trendy almond milk contains healthy fatty acids, which aid weight loss and lower so-called ‘bad’ cholesterol, other essential nutrients are lacking, the research adds. Study author Sai Kranthi Vanga, a PhD student from McGill University, said: ‘Consumers associate these alternatives to be a direct substitute of cow’s milk which might not be true in all cases’. Cow’s milk is the most common allergy affecting babies, with up to 3.5 percent of infants suffering, however, around 80 percent grow out of this by 16 years old.